Note: this post tells the customer story of Captain Train. However we recently switched to a new system for building our web-app. To host our source-code and perform merge-requests, we’re using a self-hosted instance of GitLab. It’s nice, open-source—and features an integrated build system: GitLab CI. GitLab CI allows us to add more runners very easily. And now that builds are performed in Docker containers, we don’t have to configure the runners specifically with our build tools: any out-of-the-box server will do. Using GitLab CI, the build jobs are determined solely from the .gitlab-ci.yml file in the repository. This makes it really simple to edit, and you get all the niceties of your usual git work-flow: versioning, merge requests, and so on. You don’t need to ask permission to add CI to your project. Lowering the barrier to entry for CI is definitely a good thing for engineering quality and developer happiness. GitLab CI makes it really easy to build and test the branch of a merge request (or a “Pull request” in GitHub slang). Just a few lines added to our .gitlab-ci.yml file, and we were running tests for every push to a merge request. We get nice red-or-green-status, the quite useful “Merge automatically when the build succeeds” button — and, as branches are now tested before being merged, much less build breakage. 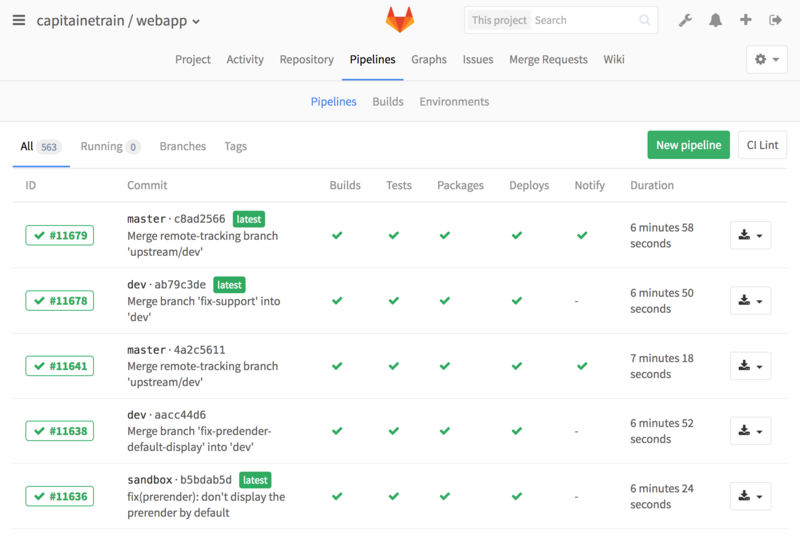 GitLab CI provides “Pipelines”, an overview of all your build jobs. This points you quickly to a failing build, and the stage where the problem occurs. Plus it gets you this warm and fuzzy feeling of safeness when everything is green. Our Android team also migrated their pipeline, and are now building the integration and production Android APK with GitLab CI. For further reading, you can find on the official website a nice overview of GitLab CI features, and some examples of .gitlab-ci.ymlfiles.